Ber ber as in 'uncle'; I can't spell pinyin well. Ma Berber and my FIL were friends since university where they read law. The cultural revolution had just begun when they graduated and they were not allowed to practice although after the cultural revolution Ma Berber became a very successful lawyer. Imagine that, a friendship that spans over 60 years, most of it across the seas, and includes their grown-up kids. 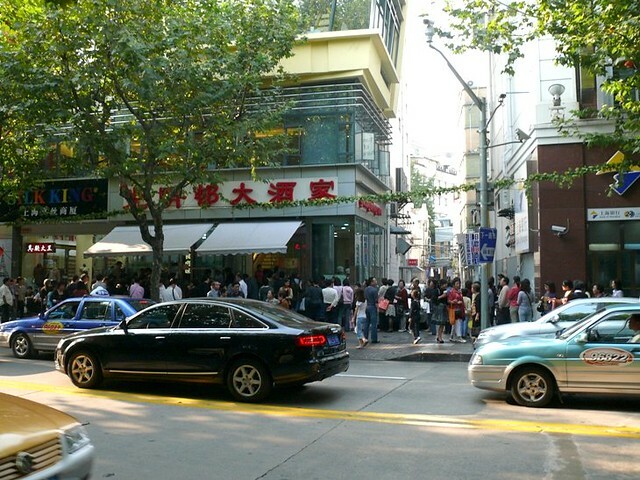 The long lines outside GMC daily for the braised meat and the savory buns jam up the walkway of this part of Huahai Lu. 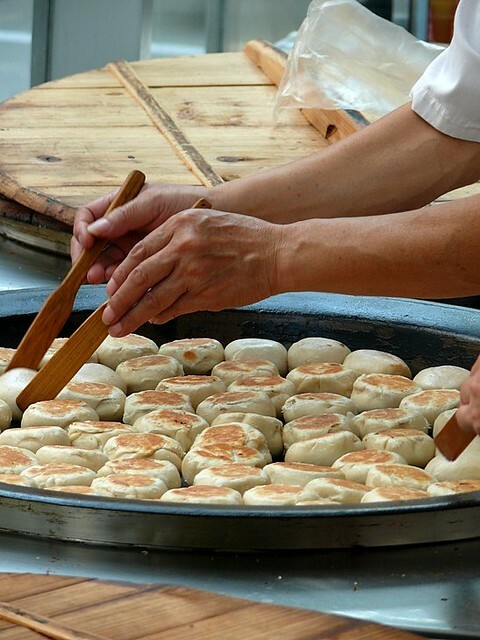 These savory meat buns must be so good that they are worth lining up for half a block away. 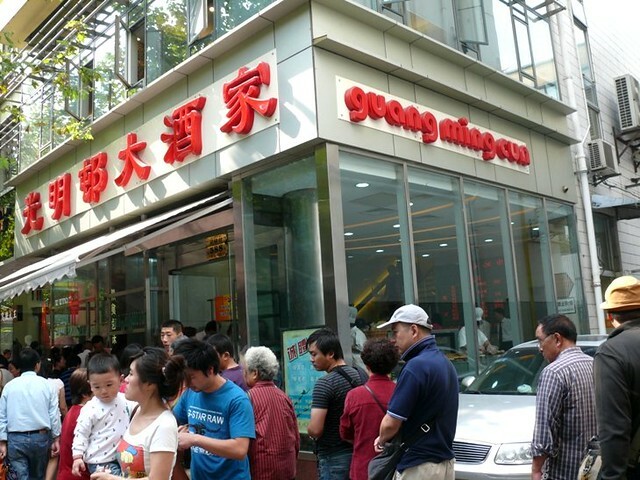 Guang Ming Cun (GMC) is a long-established restaurant in SH, something like Nan Xing was to KK. We had eaten in GMC on previous trips but this time, I was totally surprised by the food--it was excellent! There were lines outside the restaurant, one line (amazing that the Chinese actually queue) for the braised meat (pork, chicken, duck, pigeons, squid) and another for some kind of savory buns. I was curious about the buns because the line was long each time we passed the restaurant but I never got to eat the buns. 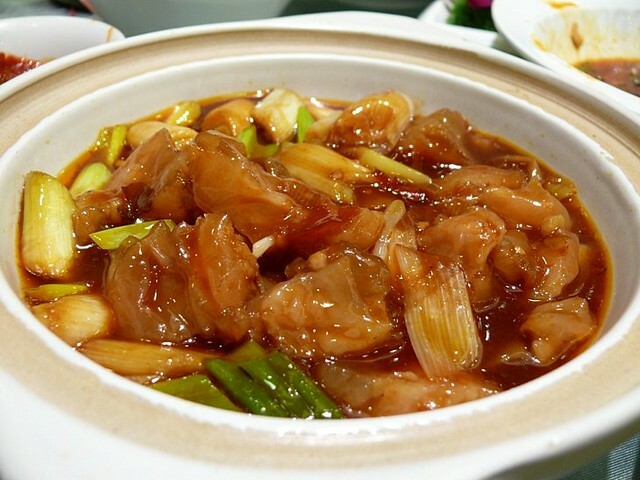 A refreshing and delicious dish of pork trotters, pig's tongue, chicken giblets, fried fish and soy beans soaked in hua tiao wine. 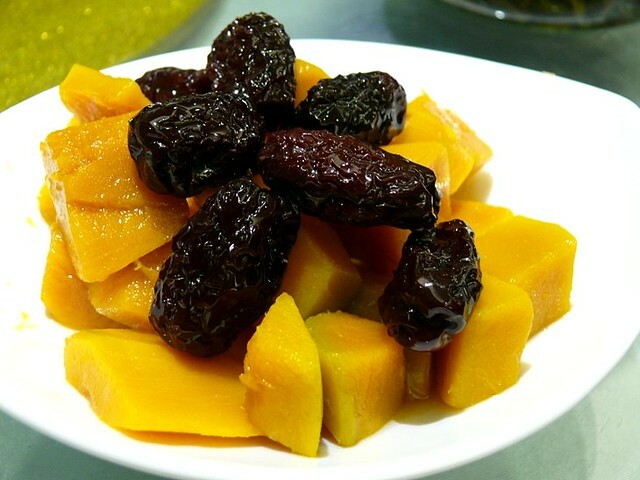 Steamed pumpkin and black dates, a popular cold item. 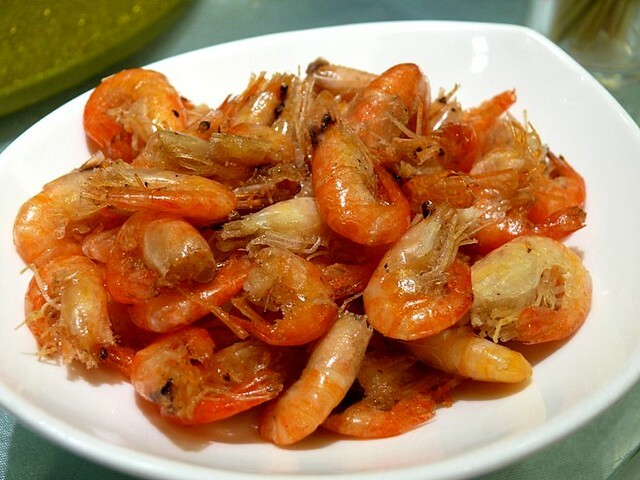 You bao xia, fried river shrimps in oil, a very Shanghainese dish. 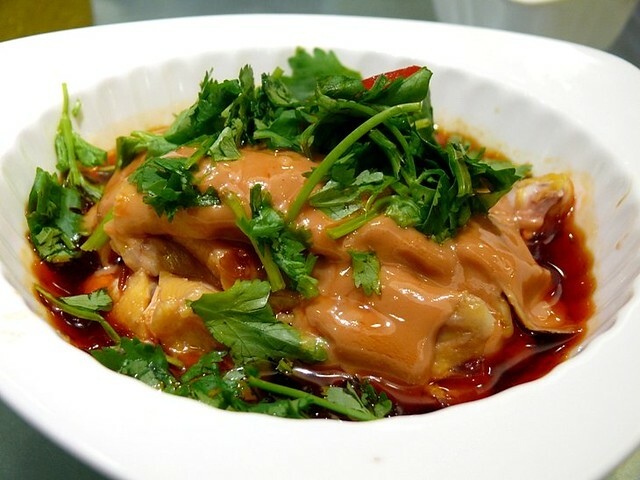 A delicious cold chicken dish with peanut sauce. 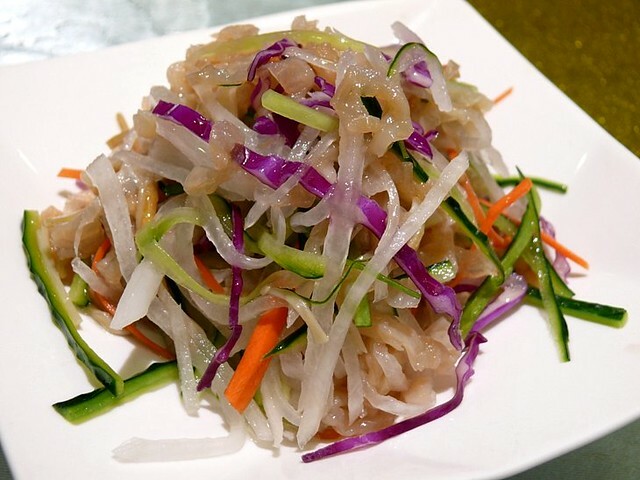 Strips of veg and jellyfish. My favorite dish of the meal, the luya or braised duck. I was told that this is one of the top items in the restaurants; people line up for hours to buy this home. The sauce was just amazing. I wanted so much to ask what brand of soy sauce they used to make the sauce. It's all in the soy sauce because there wasn't much spices. 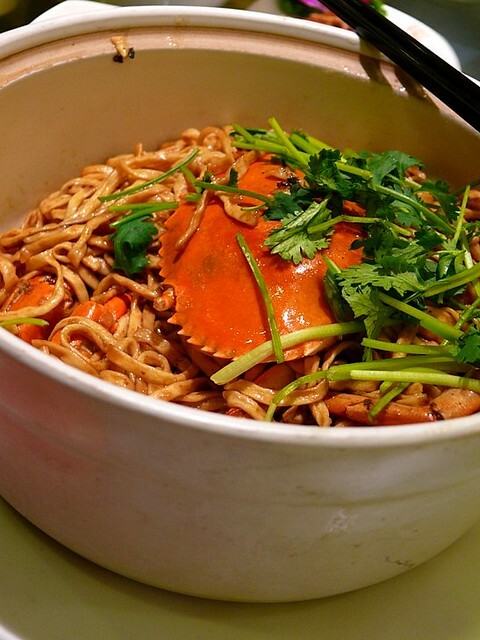 Yee mien is new to Shanghainese because it's Cantonese noodles. These were a little thicker but done very well. 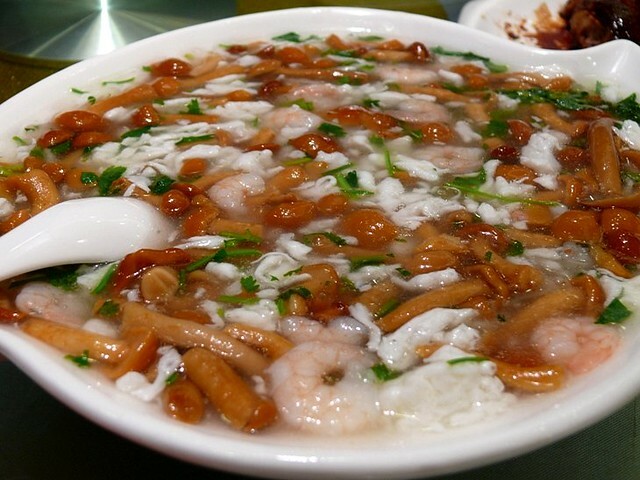 A refreshing dish of tea tree mushrooms, shrimps and 'egg flower' ie egg whites. 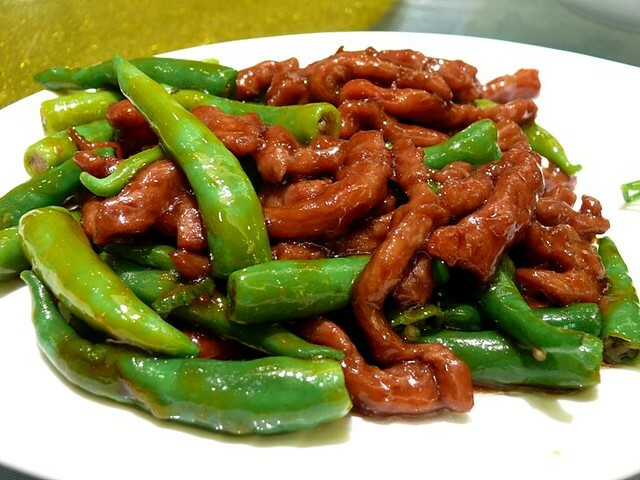 Tender beef with green peppers. Like the Spanish pimientos de padron, you never know which pepper is sweet or which is hot until you bite into one. 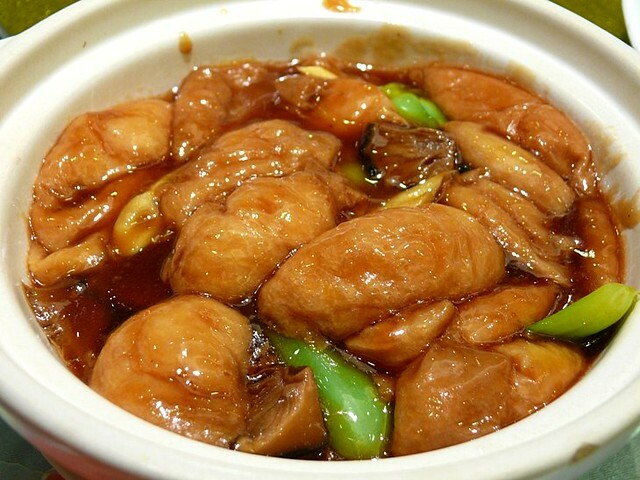 Very delicious dish. 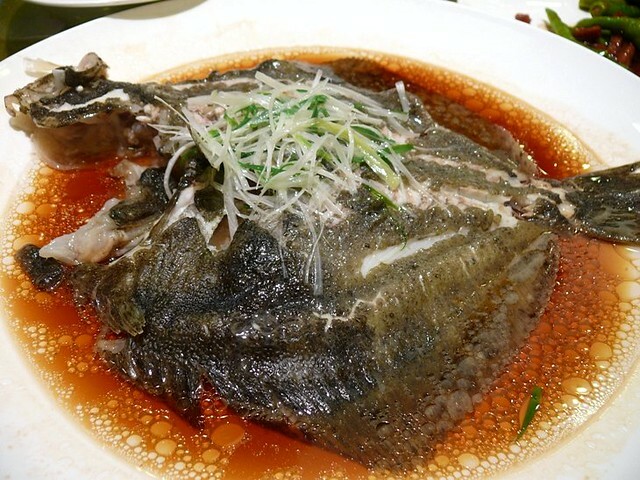 This steamed flounder is the other top dish I loved. It was tender, smooth, sweet and full of flavor. The Chinese are obsessive about the freshness of their seafood, especially fish, which has to be alive just before they cook it. Because the fish is so fresh, it is a sin to cook it any other way. Steaming allows the sweetness and freshness of the fish to be savored. The top secret to excellent steamed fish is timing because the fish must not be overcooked. Stinky moldy tofu is not my kind of food. I am convinced that craving or love for certain food is an acquired thing because how else do you explain why the Chinese love stinky tofu which smells worse than a clogged drain (yet 100% of the Chinese I met in China, even the kids, dislike cheese, even mild cheddar) and I bet 100% westerners dislike stinky tofu but love blue cheese which smells like bad feet? 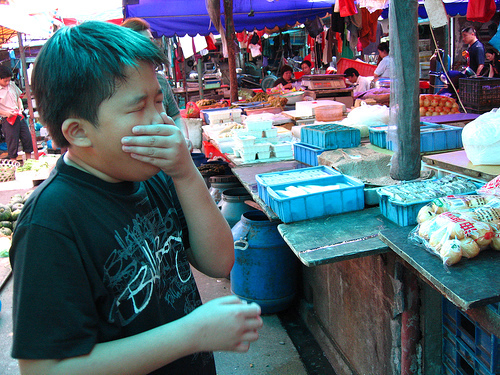 My son Wey reacting to uncooked stinky tofu during our previous visit to SH four years ago. I told you he has the most sensitive nose of anyone we know but even a stuffed nose can detect the awful stink of stinky tofu. Xi cai tofu soup, another very Shanghainese soup. 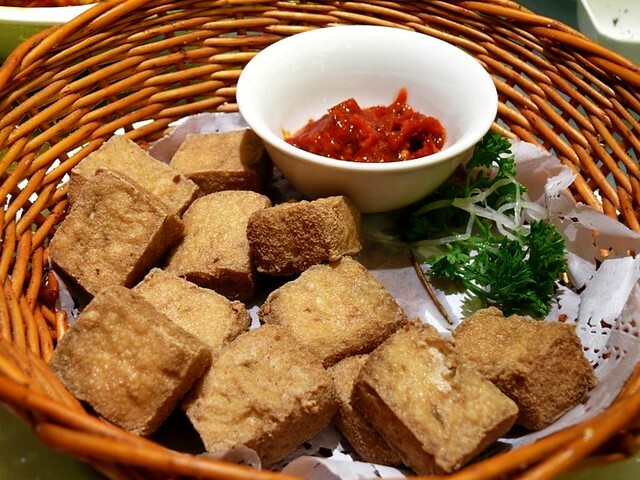 This is men jin, a lightly fried tofu so tender inside that it melts in the mouth. Absolutely amazingly tender. I was examining each one before I popped it into my mouth. How do people make such glorious food? 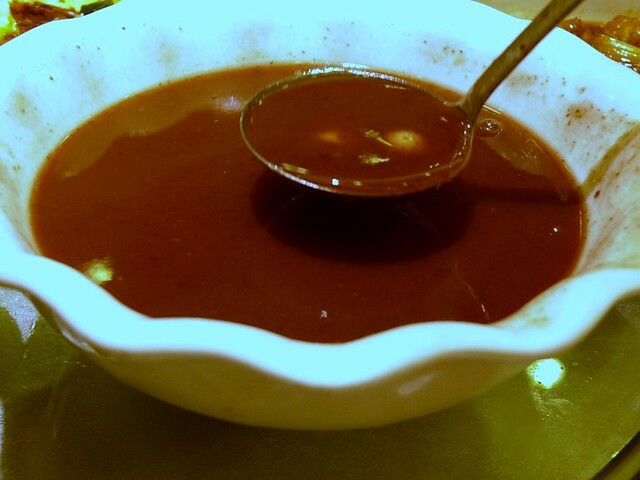 Sweet soup of red beans and 'lien xin' (lotus hearts--the seeds). The youngest person here is Xiao Shenshen on the right at 78. The rest are above 80 years and very healthy. 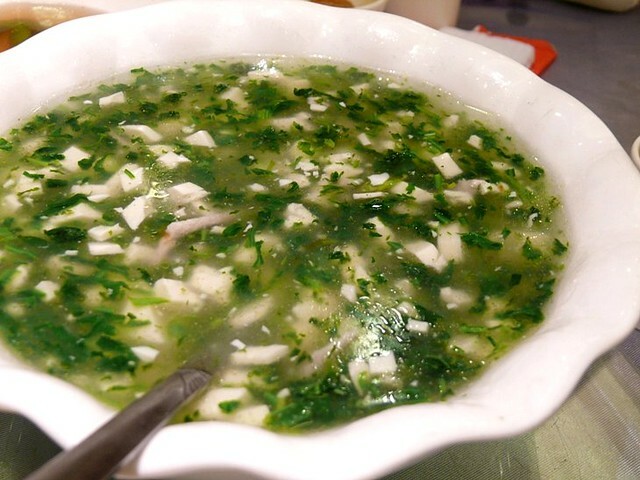 It must be tofu; the Shanghainese love tofu. 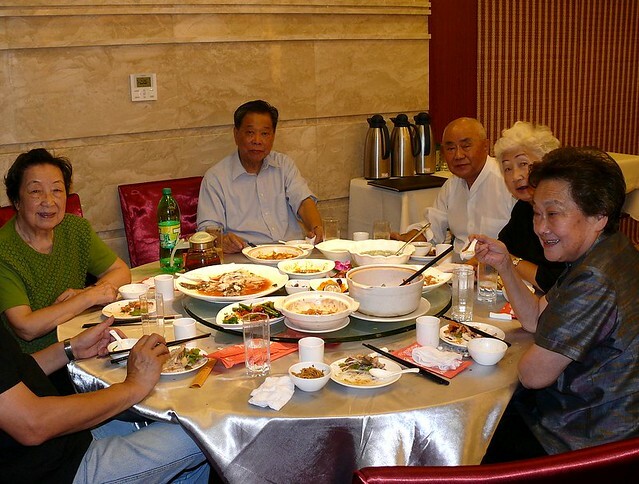 The food was ordered by Xiao Shushu ('small/youngest paternal uncle', hub of Xiao Sensen, small aunty), Hub's youngest uncle in the middle of the photo, who's 80 and very humorous. Definitely young at heart and fun to be around with. Ma Berber and his wife are second and third right. Da Shenshen ('big aunty', wife of older uncle) is on the left. I learnt a lot about food when I dined with them. They talked about where to eat what to eat how to eat. The meal above for 7 only cost "just over RMB500" (RM300/USD94), much cheaper than the fancy new restaurants. Do you have the address of this restaurant? The dishes look SO GOOD. That is a lot of food for seven of you. Was food all finished? 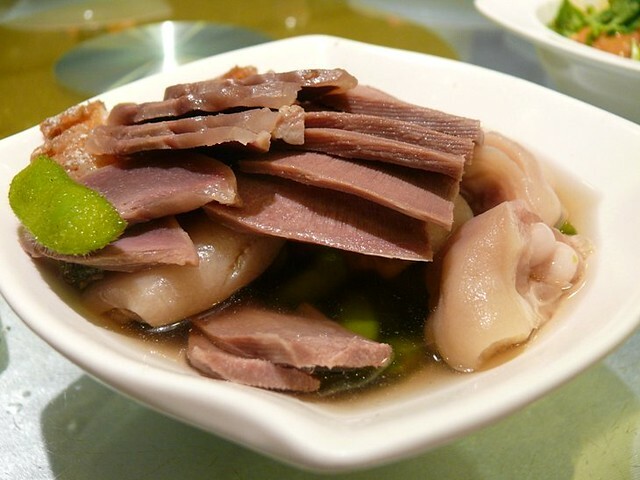 look at the food picture u posted... i want to go to shanghai to eat..
r: it'on huahai lu and any taxi driver will know. the flounder looks superb. 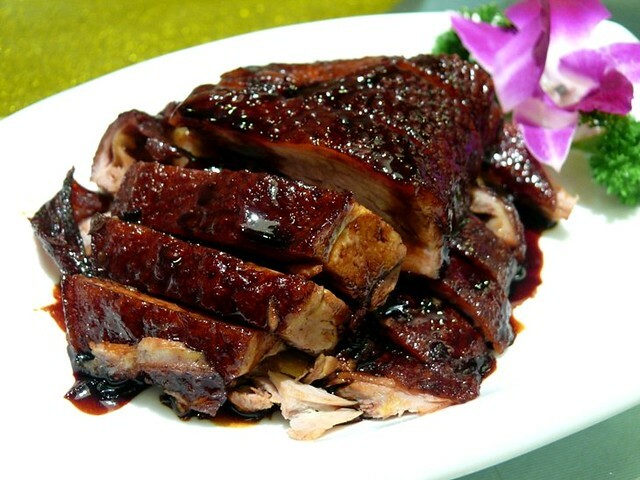 i order this when in NYC Chinatown but i think yours looks a bit tastier.